ilitary coatings are exponentially better than commercial coatings. 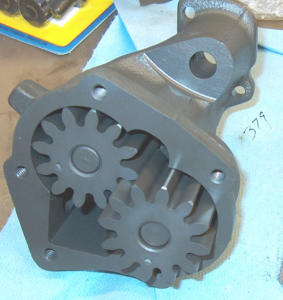 At my shop, Hekimian Racing Engines in Watertown, MA, we use what are known as Mil-Coats, proprietary coating combinations for engine components. These are not available through your commercial channels. 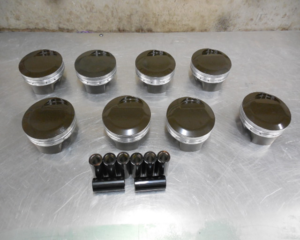 Hekimian Racing Engines’ coatings are proprietary, and Mil-Coat exceeds the commercial world coatings by great depths. There are 17 different Hekimian Racing Engines Mil-Coat coatings that can be applied to internal combustion engines. Today we will discuss only one – thermal barriers. These specialized coatings are designed for harsh thermal mechanical environments. These coatings reflect any heat that attracts or thermally soaks into its alloy neighbor, resulting in keeping those components cooler, longer lasting and less distorted. The best way to make thermal power during and after a power stroke is to maintain thermal energy to perform a pulse stress wave. If we apply coatings to the tops of pistons, bottoms of valves, combustion chambers, exhaust ports and headers – both internally and externally – we’ve made a wave of energy to make big horsepower and torque. 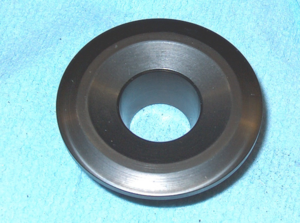 A piston top without a coating endures extreme heat, which fries the aluminum, distorts the crown, causes the ring land to not be flat and lose ring seal. Thermal barrier coatings are designed for harsh thermal mechanical environments. These coatings reflect any heat that attracts or thermally soaks into its alloy neighbor. combustion chamber and pistons soaks into the engine alloy making really hot energy to detonate the fuel. The water and oil temperatures also get hotter. 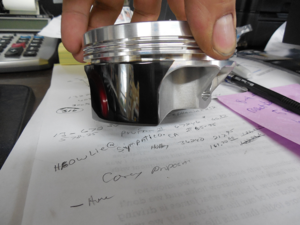 Engine builders seek thinner piston crowns whenever possible. The trouble they have is heat and a dead zone from the crown to the first ring land. With a Mil-Coat, we have advantages. 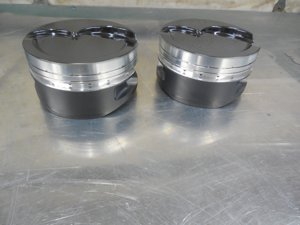 Reducing the crown thickness equals less piston weight. But the biggest gains are when these isolated heat pulses travel through to its header or tail pipe openings. The advantages we have with thermal barriers is when this thermal wave takes motion, we can change our overlap in oour camshaft to allow a faster signal from the intake valve to rush cooler air into the cylinder faster. Camshaft performance will also change with the coating pulse wave change. In essence, it acts like a mini supercharger for the air at the intake valve. For every 1-degree F you reduce your fuel temperature, you will have 1 percent more horsepower until you reach a base temperature of 59-degrees F.
Hot valves without thermal barriers will warp, causing poor valve seating. Guides and stems grow and lose clearance, which then causes more friction. Thermal coatings also have an extreme effect on the induction system or intake ports. Keeping the intake charge cold has been an industry goal for many years, so in doing so, the outside heat cannot soak through to an internal environment, thus densifying the air/fuel molecule charge. Another great thermal treatment area is the intake flanges and the bottom of the intake manifold. Oil and oven-like temperatures in the lifter valley soak right through to the intake ports. Anywhere there is heat, we can take that away by 50-75 percent, depending on the type of coatings. 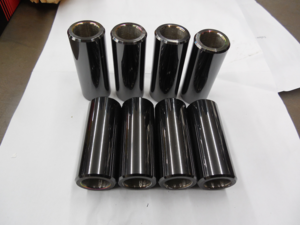 Carbon substrate coating on pins. The Mil-Coat that we do at Hekimian Racing Engines Laboratory features the most sophisticated material to date. We;ve found that commercial coats are better than nothing, but haven’t delivered the performance we’ve been looking for. Hekimian Racing Engines’ Mil-Coat Thermals are capable of being cleaned from any carbon build up. We can simply just wipe it right off at the end of the season, thus, saving the pistons for yet another season. When parts run cooler, your engine runs better. Like many other parts of the engine, a wet sump system retains a lot of heat from the oil soaking over the pump. We’ve found that putting on a layer of Mil-Coat Thermal will keep that temperature away from the shell of the pump. 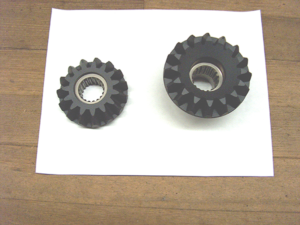 Even gears can benefit from being coated. For carburetion, the outside air temperature soaks into the aluminum bodies of the carburetors, which in turn boils the fuel. There is a physics rule that states for every 1-degree F you reduce your fuel temperature, you will have 1 percent more horsepower until you reach a base temperature of 59-degrees F. Above that temperature, you’re losing that advantage. Coatings help keep the fuel temperature in that sweet spot. For the hats receiving the Mil-Coat Thermals, the air temperatures will drop drastically for a really cool intake charge down into the intake manifold or blower. Hekimian Racing Engines’ Mil-Coat Thermals are capable of being cleaned from any carbon build up. You can simply just wipe it right off at the end of the season. How much vapor temperature is soaking into your cast or billet supercharger housing? What do you think would happen if you cool that baby down? The result is you now can add more boost without charging the air temps. Keeping header temperatures down on the outside keeps the engine compartment cooler. It also keeps the air inlet in the air filter way down. Coated pipes, all the way down to the tail pipe, keep the car’s floor from heating up, thus, keep the driver cooler. For hot rods using A/C, this keeps the passenger compartment cooler and the A/C easier to maintain. 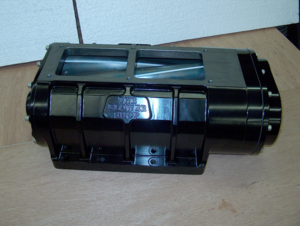 Thermally coating a blower can eliminate 50-75 percent of heat, allowing more dense air to move quicker and a cold charge for the air entering in. These units have two working entities – a compressor and a turbine. The compressor can generate a tremendous amount of incoming air from 1 atmosphere to 5 atmospheres. While the progressive compressed air starts to generate higher pressures, the heat starts to discharge over the bell curve, thus, making less densified air/fuel molecules. Thermally coating the compressors can eliminate between 50-75 percent of that heat, allowing more dense air to move quicker and with abundance on through to the turbine. Isolation of thermal energy between the turbine and the compressor is a must. The turbine produces an extreme amount of heat and wants to reverse its travel back towards the compressor. Sealing this area off maintains the cooler compressed charge more uniformly. When the turbine is trapping the heat inside it’s housing, we make that very same pulse wave that we spoke about earlier inside the cylinder. This spikes the signal to push harder through the exhaust. Note – we have found that the waste gates will have to be adjusted slightly. As with compressors, an outside thermal coating will maintain a cold charge for the air entering in.